X-Small (4-6) - $33.99 Small (6-8) - $33.99 Medium (8-10) - $33.99 Large (10-12) - $33.99 Large Plus (10-12) - $33.99 Only 1 left! When we were researching ninjas, we discovered something odd. Ninja is not the word that used to be used to describe the silent spys. Rather it was shinobi, which means: to hide. They also had some interesting local names like: rappa, which meant ruffian; and nokizaru, which meant macaque (monkey) on the roof. But today, it is cool to say ninja. And in the legends they can basically run on water, become invisible, and control the elements like the Last Airbender. Who wouldn’t want to control the elements? We do, that's for sure. And we bet your son does too. Your son is in awe of the way a ninja can sneak up on his enemy without making a sound, and beat them up without them ever knowing he was there. Now he wants to become a ninja. You thought it was just going to be a phase, so you put him in karate classes. But, nope. He wants to be a ninja, and to study ninjitsu, the art of becoming invisible. 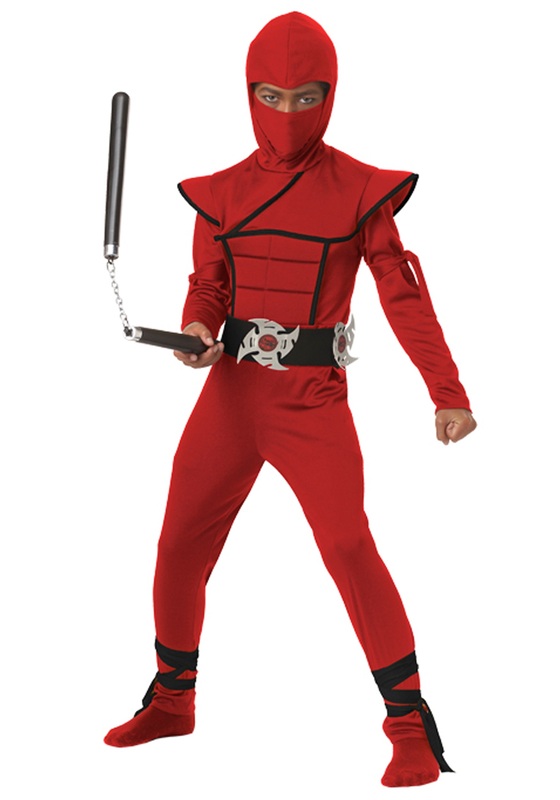 This Boys Red Stealth Ninja Costume is the perfect beginners outfit for any ninja in training. It might be a few years until he figures out how to run on water, or be able to control the elements. But, he’ll get there with some training. He wants to be so stealthy that someone will mistake him for a monkey on the roof, or just be invisible. Just maybe hold off on getting the throwing stars, unless you want holes in your dry wall.